In my previous tutorial in this VBScript tutorial series, we learned about ‘Conditional Statements in the VBScript‘. 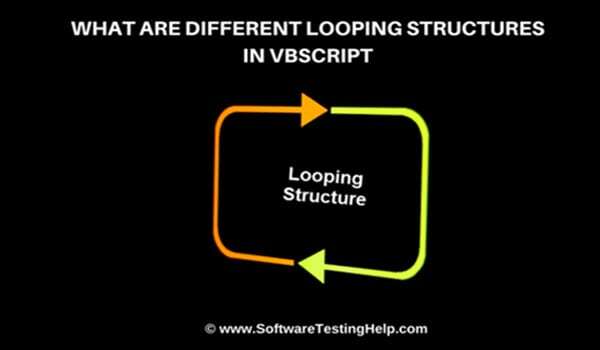 In this tutorial, I will discuss the different looping structures that are used in the VBScript. Loop is an important topic in VBScript, hence you should have a good understanding of loops for better programming experiences and to proceed further with the subsequent topics in an easy manner. This tutorial gives you a complete overview of the meaning of Loops and its different types along with clear examples for your easy understanding. Generally, Loop means to repeat something several times. In the same way, Loops in the VBScript means those statements in the code which can be repeated several times until any particular condition reaches to an end. A sequence is followed while using a loop and the statement which comes at the beginning of the code is executed first and so on. Whenever repetitions of some particular statements are required in the code then loops are used until the condition is fulfilled. Let me take a simple example to explain the concept easily. If you want to send an invitation to 10 people with the same message then you can use ‘for loop’ in this case as a counter is fixed and you know the message which is to be repeated 10 times. Let’s move to the different types of loops that are supported by VBScript. 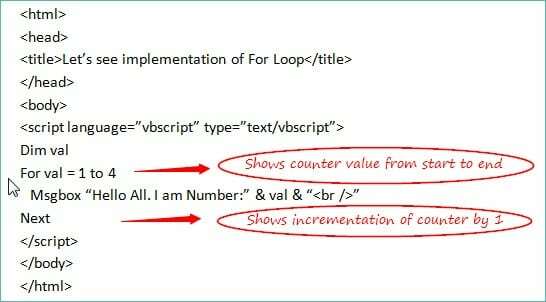 There are several types of Loops in the VBScript which can be used under various scenarios based on the requirements of a code. These types further include some other loops as well. Let’s discuss them one-by-one. This is the most basic and widely used loop. This is used in those scenarios where you know the fixed number of times for executing the statements in a code i.e. there is some fixed number of times/fixed iteration count to perform a condition. ‘For Loop’ is starting with a counter value (which we are defining with the variable name ‘var’) of 1 and this will repeat 4 times as the counter is from 1 to 4. The statement inside the loop is executed adjoining with the value of the variable. The counter will be increased by 1 using ‘Next’ keyword. Again the same process will go on and this will last for 4 times as the range is from 1 to 4. For Each Loop is an extension of For Loop. This is used in case of ‘Arrays’. When you want to repeat the code for each index value of an array then you can use ‘For Each Loop’. This works in the same manner as the above but the implementation is slightly different. An array is defined by the name ‘array’ with the index values ranging from 0 to 3. ‘For each loop’ will start from 0 indexes of an array and go on till it reaches to 3 i.e. loop will go 4 times. Code written inside the loop will be executed 4 times with value of ‘val’ variable changing as per the index values of an array. When all the index values are executed, the loop will come to an end and the cursor will move to the next statement of the loop. 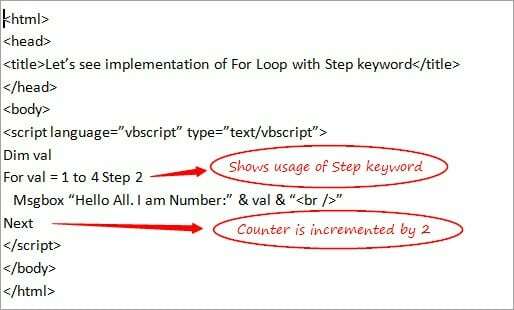 In the case of ‘For Loop’, the counter is incremented by 1 when it comes to ‘Next’ keyword. But if you wish to change this value and if you want to specify the counter value by yourself then you can do so with the help of ‘Step’ keyword. It can be a positive or negative value depending on the requirement and accordingly it will increase or decrease the counter value. ‘Exit For' is used to exit from the ‘For Loop’ block of the code. 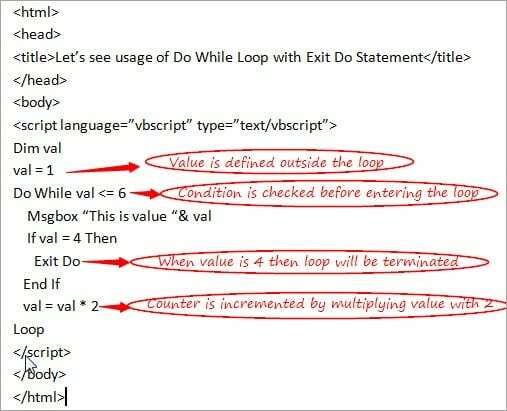 If anytime, in between the loop you wish to exit, then you can do so using the ‘Exit For’ Statement. In the above example, ‘For Loop’ is terminated when a value is equal to 3 and hence, the message is displayed only once. Let’s take a look at the next type of loop. Do Loops are used when you are not sure about the number of repetitions (unlike in case of For Loop) that can take place in the code on the basis of some conditions. There are 2 types of Do Loops in the VBScript. Let's discuss each of them in detail. This makes use of keywords ‘Do’ and ‘While’. This can further be divided into 2 cases depending upon the placement of the ‘Do’ and ‘While’ keywords. In the first case, Do and While are used in the beginning of the loop and in other cases, Do is used in the beginning of the Loop whereas While is used at the end of the loop. Value of a variable (val) is declared and defined explicitly outside the loop unlike in the case of For Loop where it is declared in the For Loop statement only. Do while Loop starts with the checking of the condition if the value of a variable is less than or equal to 6. The message written inside the loop displays when the condition gets satisfied. If the value of a variable is equal to 4 then the loop is terminated as Exit Do statement is used at this point and the cursor will move to the next statement of Do While Loop. Hence no output is produced after the value of the variable becomes equal to 4. The counter is then incremented on the basis of the increment condition that is assigned i.e. val * 2 unlike in the case of ‘For Loop’ where the counter is automatically incremented by 1 with the use of ‘Next’ keyword. Note: If the value of a variable is declared as 10 i.e. val = 10 in the above example then Do While Loop cannot be executed even at once as condition val <=6 can never become true. As I mentioned in above note that Do While maybe not able to execute even at once when the condition is not satisfied at all. Do….While solves this issue and in this case even if the condition is not satisfied but at least one-time loop can be executed. Value of a variable (val) is declared and defined explicitly outside the loop i.e. val = 10. Do Loop starts without the checking of the condition (value of a variable is less than or equal to 6) and the Message written inside the loop will be executed i.e. loop will execute at least once. The counter is then incremented on the basis of the increment condition that is assigned i.e. val * 2 i.e. 10 * 2 = 20. Finally, the condition is checked at the end of the loop which will fail as val = 10 which is not less than 6. Hence, Do While Loop will get terminated here. This works in the same manner as ‘Do While’ Loops but with a difference that the Do While loop initially checks the condition and if it is true only after that the statements are executed and in the case of Do Until, the loop will be executed until the condition becomes false. This is used when you are not sure about the number of times when the loop can be executed. Do Until Loop is also divided into 2 cases like in the case of Do While. Value of a variable (val) is declared and defined explicitly outside the loop i.e. val = 1. ‘Do Until’ Loop starts with the checking of the condition that the value of a variable should not be equal to 6. The message written inside the loop displays when the condition is satisfied. Loop will work till val = 5 as when the val becomes 6 then the condition becomes false and the loop will come to an end. Note: If the value of a variable is declared as 6 (val = 6) in the above example then ‘Do Until’ Loop cannot be executed even at once as when val =6, the condition becomes false and a loop cannot be executed at all. As mentioned in the above note that ‘Do Until’ loop may not be able to execute even at once when the condition is not satisfied at all; Do….Until solves this issue and in this case even if the condition is not satisfied, at least one-time loop can be executed. Value of a variable (val) is declared and defined explicitly outside the loop i.e. val = 6. ‘Do’ Loop starts without checking the condition if the value of a variable is less than 6 and the Message written inside the loop will be executed i.e. loop will execute at least once. Counter is then incremented on the basis of the increment condition that is assigned i.e. val + 1 i.e. 6 + 1 = 7. Finally, the condition is checked at the end of the loop which will fail as the val is equal to 6 and hence ‘Do Until’ Loop will be terminated. However, this is same as the ‘Do While’ loop which we discussed just now but as it’s good to know about all the types of loops, let’s see about this too. This is also used when you are not sure about the number of repetitions in a loop. This tests the condition before entering the loop. The counter is then incremented on the basis of the increment condition that is assigned i.e. val will be multiplied by 2 every time when the condition satisfies. When the value of a variable becomes more than 6, the loop will come to an end and the statements written after ‘Wend’ keyword will be executed. I hope that you must have gained good knowledge about the meaning and different types of loops in the VBScript through this tutorial. This, in turn, will help you in proceeding with the upcoming tutorials of the series. 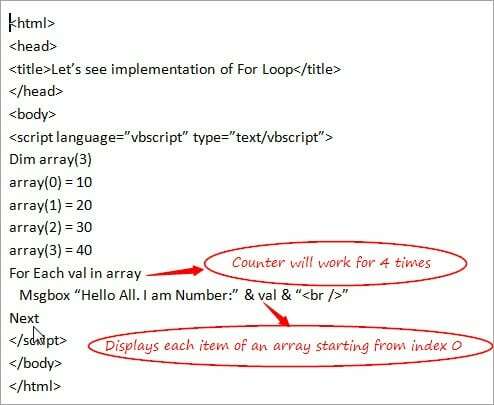 Next Tutorial #6: We will discuss ‘Procedures and Functions’ in the VBScript in my next tutorial. Stay tuned and share your experience on working with Loops and let us know your thoughts about this tutorial.